The child who eats everything is rare to find, isn’t it? Feeding the child is a challenge to most of the moms. While you want to nourish your child with grains, proteins, dairy, fruits, etc., the child keeps running around to avoid eating. This sight is quite common in every household. So, what should you do? How about trying to prepare some foods that are able to tempt and drool your child and are super healthy as well? Finger foods are easy to eat, look inviting, and can be prepared quickly. 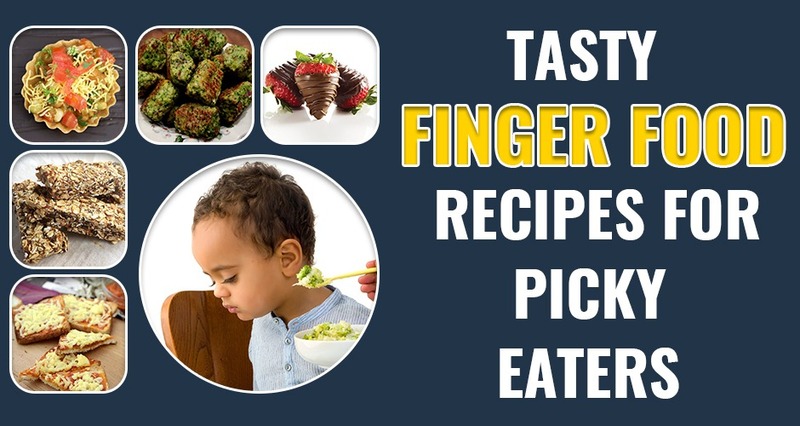 Here are some top finger food recipes for picky eaters. Here are some baby finger food recipes for you. You can alter the ingredients as per the availability and taste preference of your baby. Drain and chop the broccoli. Now take a bowl and add chopped broccoli, garlic, cheese, butter, beaten egg, tomato sauce, and bread crumbs. Take a bowl and add chopped capsicum, carrot, corn, mushroom. Put some salt and pepper. Take a pan and melt some butter. Add the chopped vegetables in the pan and let it cook for 5 minutes. The crunch has to remain so don’t overcook. Top the vegetables on the bread slice. Add cheese and herbs on top. Grill the bread pizza in the oven and serve. Cut carrots in the shape of fries. Take a bowl and toss the fries in some olive oil, parmesan cheese, garlic powder, mixed herbs, salt, and pepper. Arrange the carrot fries on baking tray. Bake for 15 minutes till the carrots are soft and crispy. Serve with some more cheese on top. Children love strawberries, and why not, it looks super tempting and fascinating! The best part is that this berry is loaded with vitamins, fiber, manganese and potassium, and antioxidants. To make it more drool-worthy, serve your child chocolate coated strawberry. Pick one strawberry and attach a toothpick. You can add another superfood, sprouts, in your baby’s diet if he/she is more than 2 years of age. Sprouts are a powerhouse of nutrition. It is rich in fiber, protein, micro-nutrients, essential fatty acid nutrients, vitamins, minerals, antioxidants, and enzymes. Sprouts canopies is a great way to consume healthy sprouts. Take a bowl and mix sprouts, onions, potatoes, tomatoes, chaat masala, and salt. Fill the mixture in the canapés. Granola bars can be prepared in many ways. They are delish in taste and will provide energy to your kid to keep him going. 1 cup mix of dried fruits, coconut, peanuts, chocolate chips, etc. Toast the oats and the nuts in the oven. Now in a pan, heat honey, butter, and sugar until the sugar and butter melts. Now combine roasted oats, nuts, and other ingredients. Spread this mixture on the greased pan. Chill these bars for 2-3 hours.